New York, Nov. 26 -- Monday night brought one of the most brilliant premieres the opera ever saw in New York , and the parterre boxes were more the "glittering horseshoe" than ever, for the display of jewels was unequaled, and the lights, differently arranged this year from ever before, brought out the glitter of the gems and the tints of the frocks to the best advantage. White reigned: far and away the great majority of women in the boxes were in white, and the few colored gowns served merely to accentuate the general snowdrift effect. At the extreme left of the horseshoe as one entered the opera house and in Mrs. Ogden Goelet's  box, sat Mrs. Cornelius Vanderbilt  in white satin spangled in silver and wearing a tiara and necklace with pendants, all of superb diamonds. Mrs. Robert Goelet, who was Miss Elsie Whelan of Philadelphia , was also in white and wore a high tiara of diamonds, the points of which ended in huge diamonds like knobs, and her wide necklace was also of diamonds. In the next notable box was Mrs. Richard T. Wilson , whose hair is like silver, and thick. She wore it parted in the middle and twisted low at the back. Her costume was made of an exquisite shade of mauve chiffon velvet trimmed with quantities of point lace. The neck, rounded out a bit, was filled in with point lace, and from its upper edges point lace flounces fell back in bertha effect. The sleeves were of velvet to the elbow, and the lower edges were laid in upturned plaits, and from them flounces of rare old point drooped to her wrists. A diamond caught the lace together at her throat. A bit further along was the dowager Mrs. Astor , gleaming in her much-written-up tiara, stomacher, and girdle of diamonds, with necklace to match, worn over black velvet. Her gown was pure white, but at each side of the form and extending from the top of her corsage to the hem of her skirt was a four-inch band of black velvet, partially concealed by leaf-like designs of pearl passementerie. Mrs. John Jacob Astor , who was with her mother-in-law, was in a rich purple gown on princess lines, of chiffon velvet striped with scarflike insertions or draperies of purple chiffon, the purple being the hue of an amethyst shade. 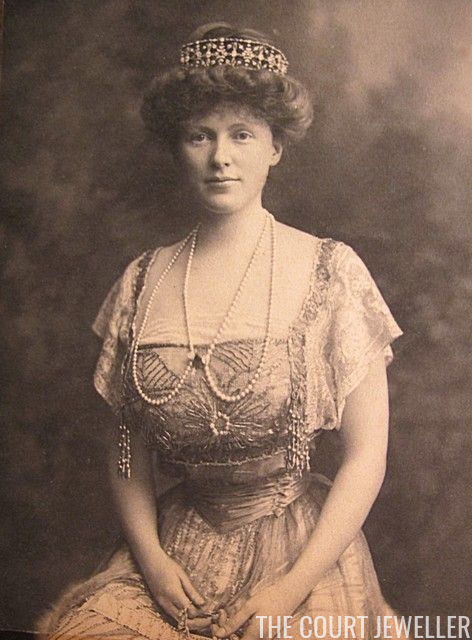 The only conspicuous piece of jewelry worn by young Mrs. Astor was a wide plastron of large diamonds, fastened at the center of her corsage, and which swung loosely across it. It was straight at the top, with the lower edge forming almost a semi-circle. Mrs. Clarence Mackay , almost in the center of the horseshoe -- the Mackays have the box formerly occupied by the late William C. Whitney  -- was in a gown of white lace over silver cloth, and her jewels were emeralds and diamonds. The lace was Brussels point, a perfectly plain skirt, and a slip bodice in princess effect, over a foundation of silver cloth, the silver gleaming through the lace, and the effect being much like that of moonlight on snow. There was a finish at the lower edge of the skirt of plaited Brussels net, and the narrow lace frills over the tops of her arms had swinging from them ropes of tiny rhinestones set in silver. From the shoulders of this frock hung a court train of silver cloth brocaded in rose patterns and edged by a five-inch band of ermine. This swung loose, showing the figure at the back. Her jewels were a necklace of diamonds and a large, loose-meshed plastron of diamonds set with huge emeralds, worn over the center of her corsage, and a particularly large emerald set with diamonds formed a clasp to the girdle at the front. In addition, a very long rope of diamonds, having one huge stone at the end, was first wound around her neck and then draped in loops down the bodice. Near Mrs. Mackay say Mrs. James A. Burden, Jr.  She wore a rich red velvet robe, very simply made, but very low and having a plaiting of lighter red chiffon and tulle bordering the corsage and sleeve bands. In her black hair quivered a large black jet butterfly, the wings tipped with emerald sequins. The Duchess of Manchester, who was Miss Helen Zimmerman of Cincinnati , wore an extremely fluffy flounced robe of white lace over silk. It was much spangled, and her blond hair, dressed low, was surmounted by an all-around crown of platinum set with pearls and diamonds. Like her hair, the crown was also worn set well toward the back. She also wore ropes of pearls around her neck. Mrs. Charles B. Alexander , a blond with quantities of red-gold hair, was in black chiffon velvet, cut square and made with extreme simplicity. Around her neck and drooping far down over the corsage hung loop after loop of superb pearls. This frock had elbow sleeves of point lace that fell in full flounces from the narrow velvet bands crossing the shoulders to the elbows. Mrs. Ogden Mills , in sapphire-blue net over satin of the same shade, wore pearls and diamonds, including her tiara. The gown was a mass of swinging blue jets, with sleeves that fell at the outside seams to the wrists, but were short at the inner seams. Further along Mrs. George Gould , the guest of Henry Clews , was in white satin elaborately trimmed with lace, and wearing her splendid tiara of diamonds and pearls and many ropes of both gems draped over her spangled corsage. 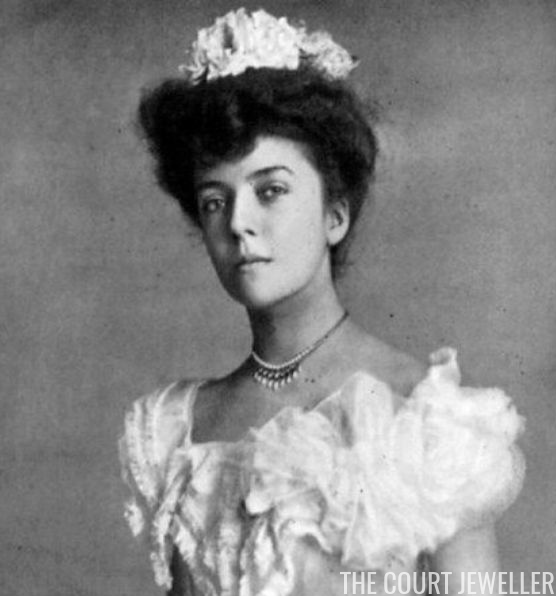 Miss Alice Roosevelt , with her much-fluffed and pretty brown hair, dressed low, sat in the W.K. Vanderbilt box , the guest of Mrs. Vanderbilt's sister, Mrs. William Travers . She wore a girlish frock of white net spangled in silver over white silk. It was cut square and had puffed sleeves. A string of pearls went around her neck. Her hostess was also in white. At the extreme right of the horseshoe in the Juilliard Box  was Miss Marion Whitaker , her dark hair dressed high at the back and having placed in it a most unusual, but in this instance effective, manner, two large pink roses, one placed higher than the other, and at the rear of the lower one. The bodice top was a brilliant rose pink, having puffed sleeves of point lace surmounted by puffs of the rose red. Her hostess, Mrs. A.D. Juilliard, was in white satin and point lace, and wore diamonds and pearls. 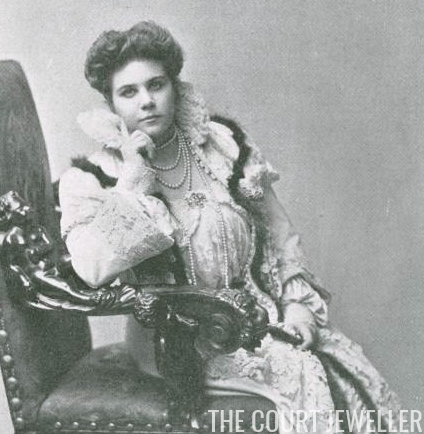 In Mrs. Vanderbilt's box  was Mrs. Alfred Vanderbilt , simply gowned in white, and wearing comparatively few jewels -- diamonds and pearls -- and with her was Miss Edith Devereux Clapp  and her fiance, the Count du Temple de Rougemont. Miss Clapp, who is a pronounced brunette, was in black chiffon velvet, with a round-cut corsage finished with folds of black tulle and four-inch-wide bands of black velvet arranged in an open lattice work over her shoulders. At the right of her corsage, a cluster of deep red roses was fastened. In the W. Seward Webb box , Mrs. F. Egerton Webb , a young woman with silver-white hair, dressed high, wore a close-fitting frock of white satin trimmed with white tulle puffs for sleeves and as a finish for the corsage. Knots of pale turquoise blue were used at the right of the corsage, and bows of the same were fastened in her white hair. She looked like an old-time French marquise. 2. Mary "May" Wilson Goelet (1855-1929). Born in Tennessee, she came to New York after the civil war and married Ogden Goelet, a real-estate millionaire who split his time between New York and Newport. Their daughter, also called May, married the 8th Duke of Roxburghe in 1903. 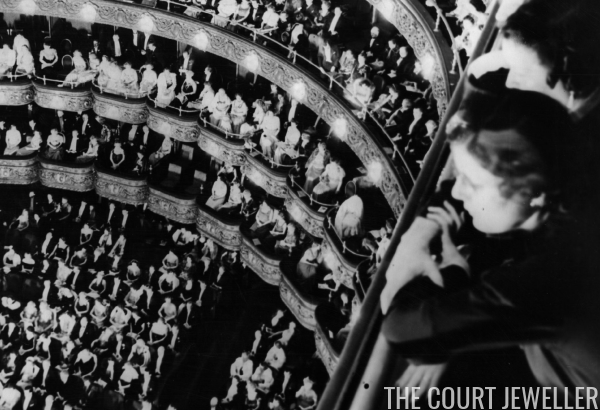 When Mrs. Goelet died in 1929, her daughter inherited her opera box. 3. Grace Wilson Vanderbilt (1870-1953). She was the sister of May Goelet; her husband, Cornelius Vanderbilt III, was largely disinherited when they eloped. The couple were often in Europe and counted numerous royals among their circle of friends. 4. Elsie Whelan Goelet (1883-1959). In 1904, she was the newlywed wife of May Goelet's son, Robert Wilson Goelet. After Robert and Elsie divorced, she married the artist Henry Clews, Jr., the son of a wealthy banker. Henry and Elsie spent much of their married life restoring a chateau on the French riviera. 5. Marion Mason Wilson (1875-1970). She was the wife of Richard Thornton Wilson, Jr., which also made her a sister-in-law of May Wilson Goelet and Grace Wilson Vanderbilt. Her husband was deeply involved in the world of horse racing, even serving as president of the group running the Saratoga Race Course. 6. Caroline Schermerhorn Astor (1830-1908). Raised in one of New York's most prominent families, her marriage to William Backhouse Astor, Jr. cemented her position as the head of New York society. She was seen as a gatekeeper -- unless you were approved by Mrs. Astor, you could not be a part of New York's elite. Her daughter, Carrie, was married to Marshall Orme Wilson (brother of May Wilson Goelet, Grace Wilson Vanderbilt, and Richard Thornton Wilson, Jr.). 7. Ava Willing Astor (1868-1958). She was the first wife of Mrs. Astor's only son, John Jacob "Jack" Astor IV. They divorced in 1909, and only a few years later, Jack died aboard the Titanic. Her second husband was the 4th Baron Ribblesdale. 8. Katherine Duer Mackay (1880-1930). She was the first wife of Clarence Mackay, a financier whose father was a silver mining magnate. Katherine was deeply involved in the fight for women's suffrage. Following her divorce from Mackay, she married Joseph Blake, who had been her husband's personal physician. Her daughter, Ellin, married the famous songwriter Irving Berlin. 9. William Collins Whitney (1841-1904). Founder of the famous Whitney family, he served as Secretary of the Navy under Grover Cleveland. He had died in February 1904, so this was the first season that the Mackay family had his old opera box. 10. Florence Sloane Burden (1873-1960). Through her mother, Emily Vanderbilt Sloane, she was a great-granddaughter of Commodore Vanderbilt. She and her husband, James Abercrombie Burden, Jr., lived in the famous James A. Burden House in Carnegie Hill. After her husband's death, she married Richard Tobin. 11. Helena Montagu, Duchess of Manchester (1878-1971). Born Helena Zimmerman, she was the daughter of a railroad president from Cincinnati. 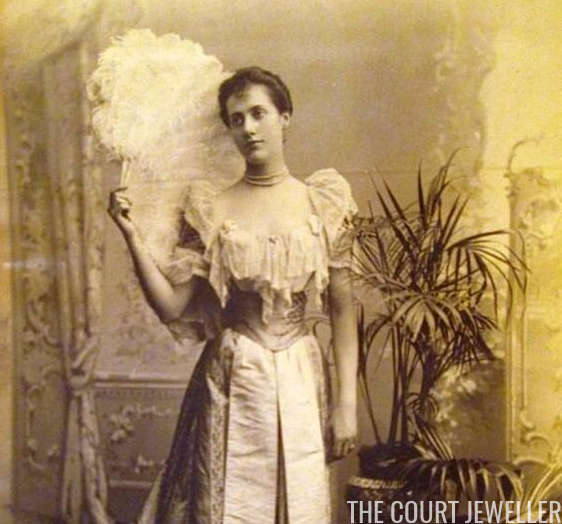 She secretly married William Montagu, the 9th Duke of Manchester, in 1900. His American-born mother, Consuelo, was appalled. The couple had four children, but they divorced in 1931. She later married the 10th Earl of Kintore. 12. Harriet Crocker Alexander (1859-1935). Daughter of a railroad tycoon, she married Charles B. Alexander, a wealthy lawyer financier. They owned a mansion on W. 58th Street in Manhattan; in 1910, the house was the site of the wedding reception for their niece, Eleanor Butler Alexander, who married Theodore Roosevelt III (son of President Theodore Roosevelt). Harriet was a major opera lover. 13. Ruth Livingston Mills (1855-1920). She was a member of an important founding family of New York, and her husband, Ogden Mills, was heir to a California banking fortune. Her sister-in-law, Elisabeth, was married to the American ambassador to the Court of St. James. Her daughter, Beatrice, married the 8th Earl of Granard. 14. Edith Kingdon Gould (1864-1921). She was a stage actress until her marriage to George Jay Gould, son of the railroad baron Jay Gould. Their daughter, Vivien, married the 5th Baron Decies. 15. Henry Clews (1834-1923) was an English-born financier. His wife, Lucy Madison Worthington, was a relative of President James Madison. They had two children: Elsie, who became a prominent anthropologist, and Henry Jr., an artist and sculptor (and the second husband of Elsie Whelan Goelet; see #4). 16. Alice Roosevelt (1884-1980) was the only child of President Theodore Roosevelt and his first wife, Alice Lee. Her life is far too interesting to sum up in a footnote. 17. William Kissam Vanderbilt (1849-1920). He inherited millions from his father, William Henry Vanderbilt, and managed family railroad interests. His first wife was Alva Erskine Smith; they were the parents of Consuelo Vanderbilt, who famously married (and divorced) the 9th Duke of Marlborough. W.K. Vanderbilt married his second wife, the twice-widowed Anne Harriman Sands Rutherfurd, in 1903. 18. Lillie Harriman Travers (b. 1870). Her father, Oliver Harriman, was a prominent New York businessman (who died in March 1904); her sister, Anne, was the second wife of W.K. Vanderbilt. Lillie's first husband, William R. Travers, Jr., was the son of a prominent lawyer and Wall Street investor. (Her husband's nieces included Katherine Duer Mackay; see #8.) The couple were separated by 1904, and her husband committed suicide the following year. She later married Frederick C. Havemeyer, whose family was in the sugar industry. 19. The Juilliard Box was indeed owned by those Juilliards. Augustus D. Juilliard and his wife, Helen Cositt Juilliard, were successful philanthropists who bequeathed enormous sums of money to support the arts. A.D. Juilliard was the president of the Metropolitan Opera from 1892 until his death in 1919. 20. Marion Ludlow Whitaker (b. 1877). She was the daughter of James K. Whitaker; in 1905, she married Joseph Earle Stevens, who was involved with the timber industry in South America. He published a book about his earlier travels, Yesterday in the Philippines, in 1898. 21. Alice Gwynne Vanderbilt (1835-1934). Daughter of a Cincinnati lawyer, she married Cornelius Vanderbilt II after meeting him while teaching Sunday School. She and her husband built "The Breakers," the famous mansion in Newport. 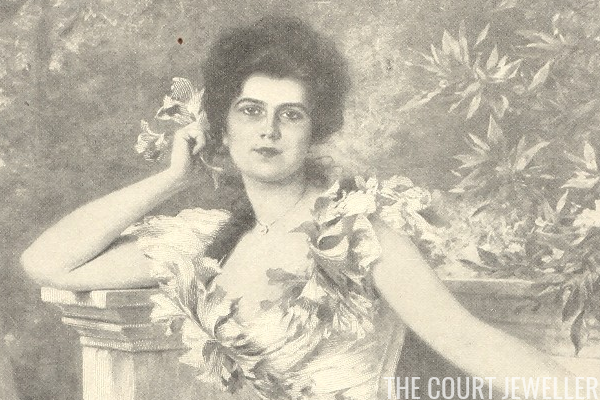 Alice was the matriarch of the Vanderbilt family for more than half a century. 22. 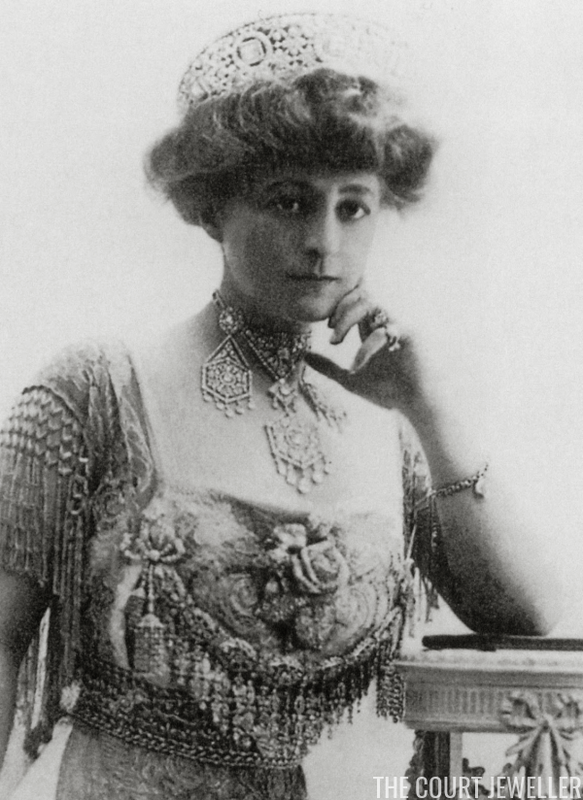 Elsie French Vanderbilt (1879-1948) was the first wife of Alfred Gwynne Vanderbilt. Their only child, William Henry Vanderbilt III, later became governor of Rhode Island. Elsie divorced Alfred in 1908. Both remarried, but Alfred died on the Lusitania in 1915. 23. Edith Devereux Clapp (1876-1965). She was the daughter of Nicholas Devereux Clapp of Chicago and his second wife, Adele Wolfe Clapp. In December 1904, she married Rene, Comte du Temple de Rougemont, and moved to Paris. 24. William Seward Webb (1851-1926), owner of this opera box, was a businessman and founder of the Sons of the American Revolution. His wife, Lila, was the daughter of William Henry Vanderbilt (and, therefore, a sister of Cornelius Vanderbilt II and W.K. Vanderbilt, among others). 25. Mary Randolph Webb (1870-1962). She hailed from Philadelphia and married Francis Egerton Webb, a banker. Francis was William Seward Webb's brother.